Simple sales forecasting is exactly that! A means of planning and organising resources, activities people and time in order to deliver an accurate and precise sales forecast. A sales forecast that’s realistic and universal, a process and an output that’s a key building block in the growth of a business. But you’d be surprised, or maybe not, at the amount of sales functions and business, that although they have a sales forecasting system, either informally or in their CRM, still struggle to get accurate, reliable and meaningful sales predictions. Meaning a huge mismatch in expectation, deliverables and ambition. Inaccurate sales forecasting really messes with cash flow, resource management, pricing, planning, purchasing, staffing…and growth, resource allocation and sleep(!! ), not to mention the inevitable sales peaks and troughs. And over time it costs a lot too. So How Does Simple Sales Forecasting Help? 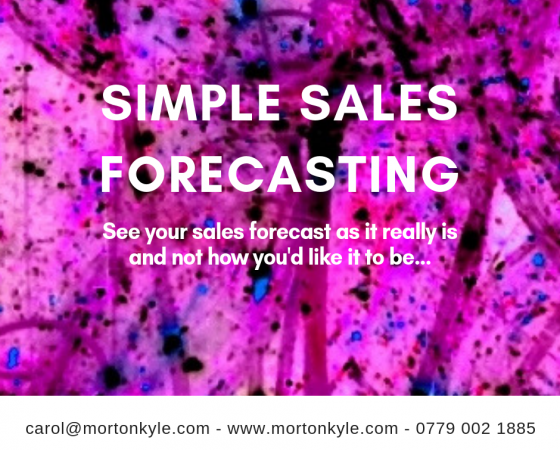 Simple Sales Forecasting is a way of fully qualifying your sales prospects before you commit them to your sales forecast. It’s the ultimate sales planning tool. Giving you sales insights that not only lead to a more predictable sales performance AND a predictable way to drive sales growth, you also get a better sales/buyer interface. Simple Sales Forecasting has an inbuilt universal scoring method that’s used throughout the sales function and the business. Every single on of your sales team will have a very different slant on what a fully qualified sales prospect looks like. That slant will differ depending on where they are against target, if they’re having a good month or a bad month, if they’re under pressure of not. That lack of absolute clarity costs you. And costs you the time you should be freeing up by ditching the ‘not so great’ prospects and jumping in with the prospects that will change your world, value, respect, adore and worship you like ‘not so great prospects never ever could. That’s why I say no to Fluffy Forecasting. Are You Suffering From Fluffy Forecasting? Here’s your quick self diagnosis kit? 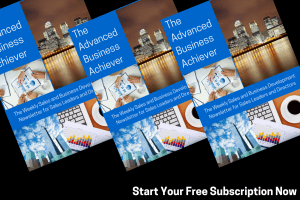 Your sales forecasts vary by more than +/-15% each month? There are peaks and troughs in your sales performance/cash flow? Do you have an over reliance on existing business? Are you struggling to plan resources, work flow, purchasing, stock? Is your production function running at wildly fluctuating rates, efficiency, capacities due to lack of reliable sales information? Are you able to produce accurate long range sales forecasts? Is your sales team motivation low? Do you constantly find your sales team offering discounts to bring work in early? Or simply just offering discounts because you can’t deal with the competition who are happy to buy business? Do the bulk of your sales come in during the last week of the month? Have you got wildly fluctuating close rates across the sales team? Huge discrepancies between average order values across the sales team? A sales CRM that’s crammed full…but you’ve no idea of the value that’s in there? You’re in the revolving door that is Fluffy Forecasting, bouncing prospects forward for three months because you’ve no idea what to do with them when they don’t close as promised. Seeing the same names being shunted from month to month in the hope that one day the deal will drop. 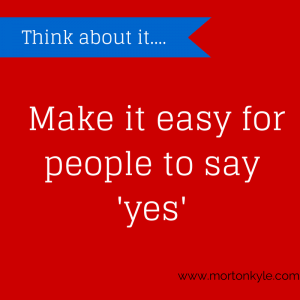 Perhaps even…having more sales people in your sales team than you actually need? Or having more leads than you actually need? You’re building a solid Grade A + sales engine and a huge business asset = you’re no longer in danger of being held hostage when sales people leave. Attended by Sales Leaders, Business Owners, Sales Team Leaders, Sales Professionals and Sales Trainers. Simple Sales Forecasting is a two day course, further to an onsite sales audit, available through the UK/Globally. Simple Sales Forecasting is the only known cure for Fluffy Forecasting. This entry was posted in Blog, Sales Leadership, Sales Management, Sales Performance Management, Sales Pipeline Management, Sales Strategy and tagged Saleas Forecasting, Sales Cycle, Sales Pipeline, Sales Qualification. Bookmark the permalink.